At the end of September I participated in the Digital Humanities Conference Australasia, held at the UniSA City West campus. It was an opportunity to hear from people working in the digital humanities around the world, and I enjoyed talks on topics from the intersection of technology and museums, to how social media analysis has changed over the last ten years, to the way that technology can broach traditional theatre. I gave a paper on museums and their use of technology, with two case studies. This is something that I first became interested in during my Masters studies, where I did research at the National Motor Museum on their Bush Mechanics exhibition. I am really excited to be putting a lot of what I learned into practice at MOD. in my exhibitions coordinator position. I might be biased, but I think it’s a really exciting and important part of contemporary museum practice. MOD. is a key example of how museums can use technology to make audacious and engaging exhibits. Read on if you are interested in finding out more! Technology first started infiltrating the museum world in the late 20th century as a way to encourage new methods of communication. The growth of technology’s popularity in museums has resulted in a wider range of choice regarding how we interpret topics, but also a greater number of ways for visitors to interact with exhibits. Today, technology is a key element of interpretation strategies and it is widely agreed that digital technology enables visitors to engage more deeply, encourages social interaction within exhibits, and transforms the visitor experience from passive receiver to active participant. It broadens the possibilities available to us and offers new opportunities to ensure that we are bringing our communities into the museum space to talk for themselves. I first became interested in museums and their use of technology during my Masters studies. 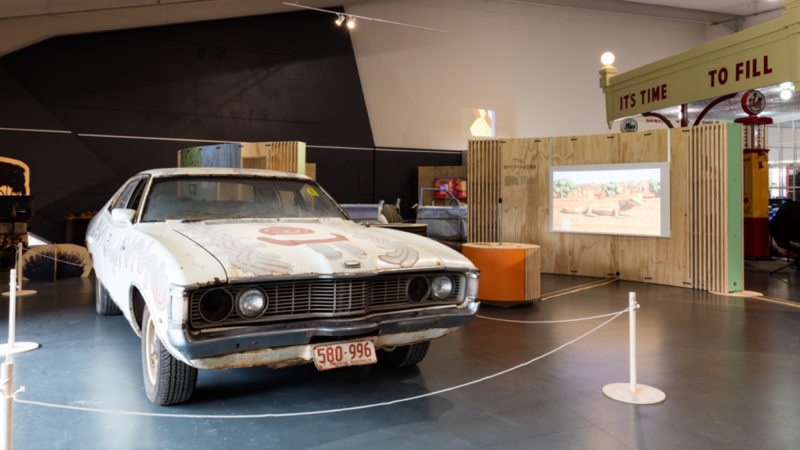 I was able to focus this interest in my dissertation, which looked at Bush Mechanics, an exhibition that was showing at the National Motor Museum in Birdwood last year before its current national tour. I am really excited to now be working at MOD., Adelaide’s newest museum which looks at the intersection of art, science, and innovation, and has what I think might be some of the most exciting uses of museum technology in the country. Today, I am going to talk about Bush Mechanics and MOD.IFY, the current exhibition at MOD., and look at the way that both of these exhibitions utilise technology to tell stories. Bush Mechanics premiered on the ABC in 1999 and was made into a television program in 2001. It’s about a group of Warlpiri men from Yuendumu in Central Australia who make use of ​Nyurulypa​, or good tricks, to get their cars running. One famous scene is when the men are travelling to another community for a gig and they need a trailer. They cut off the roof of the car and they use that instead. It’s uniquely Australian and it’s funny, and they play on this. The television show is produced by Pintubi Anmatjere Warlpiri Media, an Aboriginal owned and operated media company. The creation of PAW Media resulted from a push to ensure that the Warlpiri community was put front and centre in their television production. In the case of Bush Mechanics it gave them the opportunity to create the program they wanted to create, to tell the stories they wanted to tell. Bush Mechanics the exhibition uses the television program as a way to explore the adoption of motoring in Central Australia, considering motoring and non-motoring issues facing Indigenous groups. As with the television program, the exhibition was developed in collaboration with PAW Media. The exhibition makes use of a lot of technology, it really is more technology than objects. It has fairly standard AV displays and tablets distributed across the space, but it also boasts an augmented reality iPad application, a manual gear stick controlled AV display, a video game, a Claymation studio, and a slot car track. MOD. at the University of South Australia is a futuristic Museum of Discovery that opened in May. The museum seeks to inspire 15-25 year olds about science, art, and technology, as well as to be a place for young people to hang out and just be. We produce an exhibition every six months, as well as a program of workshops, talks, and events. The first exhibition is called MOD.IFY: It’s not what you know. It takes visitors on an immersive journey that challenges what it means to be human through 7 gallery spaces. In these spaces you explore augmented realities, challenge your perception of pain, you are put at the centre of stories about space and place, and consider what makes us human. MOD.IFY showcases interactive exhibits made up of research from within the university and beyond, as well as creative collaborations. As Australia’s leading future-focused museum, MOD. makes great use of technology. But there are two specific exhibits that I am going to focus on in my discussion today: Purle Munaintya and Our Sky, both which make use of various technologies in order to tell stories. These are two exhibitions that I hope a few of you would have had the chance to visit on Tuesday night at the DHA opening. This paper will explore the different ways that the museums make use of technology to tell stories and consider four important components of the museums’ practice that they both have in common. First up, technology as a benchmark for contemporary museum practice. Andrea Witcomb calls the moment when technology entered the museum sphere the beginning of the “new museum”. This shift in practice provides museum visitors access to culture and heritage through a medium that had before only been associated with popular culture and modernity. While originally only usually found in science museums, technology has become a benchmark in contemporary exhibitions and is commonly used in art galleries, social history museums, and design institutions. For museums, it provides new strategies in working with objects and interpretation in unprecedented ways, remodelling the ways that visitors experience exhibits. In terms of visitor experience, many now expect technology to be a part of their museum visit. In a world where technology has become so commonplace, visitors have begun to hold museum exhibitions to new standards. At Bush Mechanics, all the visitors reported interacting with at least one element of technology and most expressed that through this they felt as if they interacted more deeply with the exhibition content. One visitor remarked, “Without [technology], it would be probably a little bit weird. You probably wouldn’t engage as much.Things that are interactive … keep you there longer.” It is interesting that this was the takeaway for the visitor. Technology is the expectation even at a Motor Museum, a place that has not traditionally been closely associated with technology. It’s a little different in considering MOD.. The museum is explicitly a science and technology museum that looks to the future, so our mission is to use new technologies to interact with visitors. In MOD.IFY, visitors are not able to get through the exhibition without interacting with technology. This leads to the next component, the importance of interaction. One of the National Motor Museum’s primary aims in producing the exhibition was to create something that engaged families and kids, who make up a large part of their target audience. Interactive technology is a key way to do this. The ​Ngapa ​car, one of the most famous cars from the television program, is the object most benefited by this. The Ngapa car is painted with a dreaming that is foreign to most non-Indigenous visitors. In the exhibition, there are two elements dedicated to interpreting the car through storytelling: the gear stick controlled AV display and an augmented reality iPad application. The AV display has a huge gear stick. Pulling it one way or the other triggers the episode of Bush Mechanics that made the car famous. In the first gear, there is an excerpt of a weather presenter reporting on drought in Central Australia. The second gear starts a video of Thomas Jangala Rice, a Warlpiri elder and Bush Mechanic, filmed while he was painting the Ngapa car with a creation story. Jangala then attempts to trade the newly painted car for a pearl shell so he can perform a rain ceremony. In third gear, Jangala is performing a rain ceremony with the pearl shell. The visitor is immersed in the show, while standing alongside the Ngapa car itself. 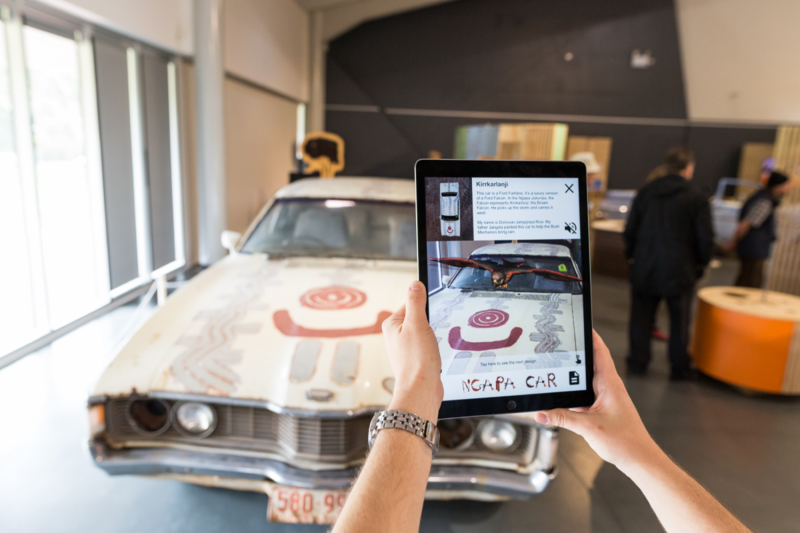 The augmented reality iPad application is on a plinth on either side of the car and enables visitors to engage with the painting. The AR brings the dreaming to life, animating each of the paintings in turn as visitors hear directly from a Warlpiri custodian of the story. This brings the Warlpiri voices to the front, allowing the story to be directly communicated with the visitors themselves. Work at MOD. is shaped by 7 design principles, which demonstrate the priorities in all the work that is carried out. The importance of interactive and participatory experiences is highlighted here. Exhibits are designed to encourage participation, they are spaces where you do things, and provide multiple ways to interact, experience, contribute, and explore. When it comes to storytelling and participatory technology, this is best seen in the seasonal exhibit, Purle Munaintya, which means star lore in Kaurna. This is a length of touchscreens several meters long that takes you on a journey of each Kaurna season. The first screen has a gently pulsing handprint. When you press your palm to the screen, it triggers the beginning. 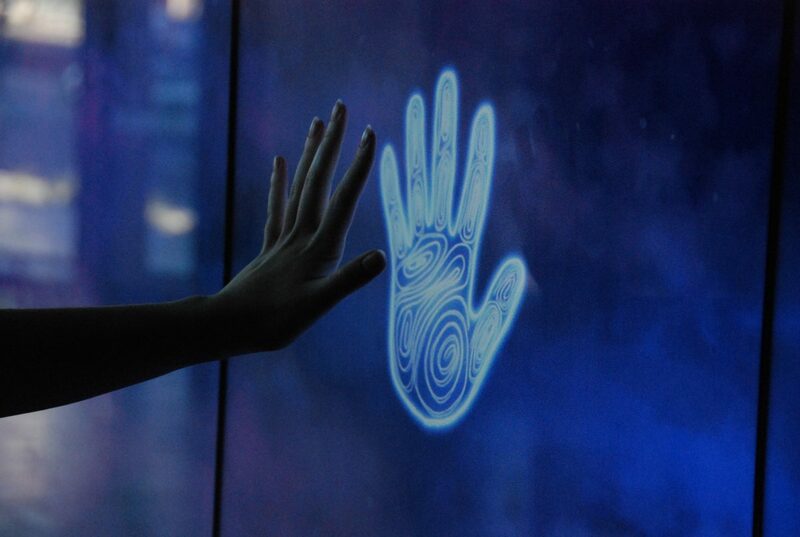 In order to hear the whole story, the visitor must stand nearby, continuing to trigger each part by pressing their palm to the glowing handprint on the screen. As seasons change, this exhibit will change to reflect each dreaming. But for now, animation and film footage tell the story of the current season of Kudlilla, the wet season that spans between July and September. Written by Kaurna cultural bearer and community leader, Karl ‘Winda’ Telfer, this exhibit tells the dreaming, asking visitors to consider what a star-filled sky or the land can tell us. Both of these exhibitions do not showcase objects in the way that traditional museums do. In many ways in these exhibitions technology has taken over the role of the object. Andrea Witcomb argues that the development of museum technology means that it can act as an object in its own right in these situations. She says that tangible technology “makes the act of interpretation into an object of attention”, offering its own meaning, rather than simply an interpretation aid. Bush Mechanics make do with what they have and interactive technology draws visitors into this world, giving them the chance to try it first hand with nothing more than a tool box. This game takes what the visitors think is a video game, and skews it. This creates a somewhat confusing experience. Visitors don’t expect to have to repair the car as they are playing. The game gives non-Indigenous visitors a view into Central Australian Aboriginal life and communicates just how ingenious the Bush Mechanics are. The game is integral in delivering this point. Half of the visitors cited ingenuity as something that would stay with them after they left. I strongly believe this wouldn’t be so without this personal interaction. MOD. is a museum of ideas, rather than a physical collection. The Universal Gallery displays an exhibit called Our Sky, and this is an interesting example to look at when considering technology taking the traditional role of objects. Another of our 7 design principles is being two-way minded, and this is incredibly significant in all that the museum does. It is important that Aboriginal knowledge and understanding is embedded in all exhibitions by providing space for creation and interpretation within our program. However, as we are working with a long-held bank of knowledge, there are obviously not always tangible objects that can be used to communicate this with visitors. Aboriginal science is considered in the exhibit Our Sky. Western astronomy is just one way of knowing the universe and Aboriginal observations, dreamings, and stories are some other ways that we can understand the solar system and how we fit into it. In this space, we contrast these. 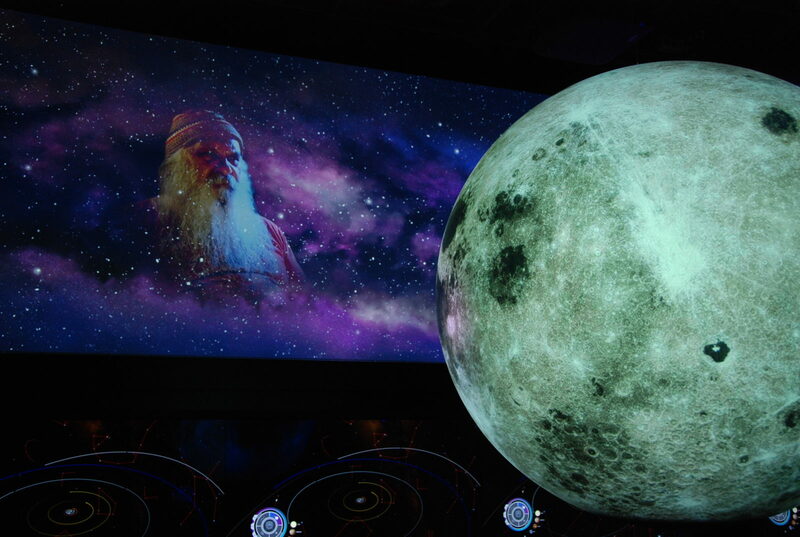 In the middle of the room is the Science on a Sphere, and surrounding this are touch screen panels featuring the Microsoft WorldWide Telescope. Visitors use these tools to travel from the Earth and beyond. They are able to visit nebulas and exoplanets, and also explore Western constellations. Above, projected in the heavens are the faces of Aboriginal custodians, who tell the creation dreaming of the Milky Way, and explain their own relationship with the skies. There are few physical objects that could be put up on a wall to contrast of Western astronomical science and Kaurna creations dreaming and ways of knowing. Interactive technology is key to telling these stories, and the ability to have Aboriginal voices doing the storytelling is significant. This leads to my final focus, the importance of community collaboration. James Clifford adapted Mary Louise Pratt’s notion of the “contact zone” in museums in his 1997 essay titled “Museums as Contact Zones”. Clifford in particular problematises the relationship between Indigenous communities and museums in the United States. He encourages collaborative museum practice when working with Indigenous objects and stories, where before did not exist. This notion has grown popular in post-colonial countries, many of which first began to work towards inclusionary programming and a more collaborative curatorial practice during the late 1990s. The importance of this collaboration is key to moving forward in presenting Indigenous exhibitions, and it can be seen in several exhibitions that have been produced in Australia over the last few years, such as First Peoples at the Melbourne Museum, Encounters at the National Museum of Australia, and the recent Yidaki at the South Australian Museum. Each of these museums have worked alongside Aboriginal co-curators or collaborators and ensured that Aboriginal voices are strong in the interpretation of the exhibition. Both Bush Mechanics and MOD.IFY demonstrate this continued shift within the sector to work in collaboration with Indigenous people, rather than simply putting their objects on the wall and leaving them be. In Bush Mechanics, the connection to the Warlpiri community was felt. One visitor said, “You hear that Aboriginal people are given brand new cars and [abandon them]… But here they are making old cars run out off bits of wood. [I think it is] very impressive.” Through its use of technology, the exhibition mediated learning and enjoyment and connect visitors with remote communities. This visitor’s prejudiced views have shifted, giving him an insight into Indigenous communities that he wouldn’t otherwise have. Similarly at MOD., it is really important that the exhibitions don’t only share Aboriginal stories and ways of knowing, but that we work with Aboriginal people to do so. Visitors to MOD.IFY watch and hear directly from the Kaurna custodians, and I think that the visual component emphasises the significance of the storytelling to the visitor. It provides visitors with a special interaction that is otherwise missing. For visitors, being able to visit museum exhibitions and hear stories from other cultures or from other perspectives is key to increasing cross-cultural understanding. It enables visitors realise that which they take from granted.Technology has become an incredible way of putting communities front and centre of these discussions. As museums, if we collaborate with Indigenous groups, we can ensure they tell their stories through us, rather than the other way around. When I first started my Masters I was curious about how technology affects a visitor’s experience of museum exhibitions, whether it helps them to engage more or learn more. But in the end, this is what I became really interested in, how technology can be used to support community voices in exhibitions. This other area of study is rich and holds promise as we enter a more equal future. Technology has enabled both the National Motor Museum and MOD. to engage with Aboriginal voices and stories and provided an alternative to using objects. This use of technology can be applied to other exhibitions that highlight communities without a strong ephemeral history, when museums seek to tell stories rather than facts, or explore concepts and ideas rather than objects. This curatorial approach with digital forms of communication means that museums can showcase stories and exhibitions that may not otherwise have objects to sustain them. This demonstrates the ability for digital technology to overcome cultural, spatial, and temporal barriers within museum exhibitions. In ​Bush Mechanics​, the technology shaped the exhibition, but the most important thing is that the exhibition was shaped by the Indigenous voices. At MOD., I am able to work with a team that puts this into practice, and it is so exciting that an Adelaide museum is prioritising this. With technology at our disposal, as museum professionals we don’t need to have all the answers. We can use new media as a way to empower communities to talk directly with visitors, to tell their own stories, and to offer new alternatives when there is no tangible history to do so. Technology can be used to close this gap, and this is a really exciting time to be doing so. Boast, R. 2011, ‘Neo-colonial collaboration: museum as contact zone revisited’, Museum Anthropology 34, no. 1, pp. 56-70. Clifford, J. 1997, Routes: travel and translation in the late twentieth century, Harvard University Press, Cambridge. Economou, M. 1998, ‘The evaluation of museum multimedia applications: lessons from research’, Museum Management and Curatorship, 17, no. 2, pp. 173-187. Economou, M. 2008, ‘A world of interactive exhibits’, in P.F. Marty & K. Burton Jones (eds. ), Museum informatics: people, information, and technology in museums, Routledge, New York, USA, pp. 137-156. Falk, J.H. & Dierking, L.D. 2008, ‘Enhancing visitor interaction and learning with mobile technologies’, in L. Tallon & K. Walker (eds. ), Digital technologies and the museum experience: handheld guides and other media, AltaMira Press, Plymouth, UK, pp.19-34. Gammon, B. & Burch, A. 2008, ‘Designing mobile digital experiences’, in L. Tallon & K. Walker (eds. ), Digital technologies and the museum experience: handheld guides and other media, AltaMira Press, Plymouth, UK, pp. 35-62. Kidd, J. 2014, Museums in the new mediascape, Ashgate Publishing, Farnham, UK. Peers, L. & Brown, A.K. 2003, Museums and source communities, Routledge, London. Witcomb, A. 2007, ‘The materiality of virtual technologies: a new approach to thinking about the impact of multimedia in museums’, in F. Cameron & S. Kenderdine (eds. ), Theorizing digital cultural heritage: a critical discourse, MIT Press, Massachusetts, USA, pp. 35-48.